Did you make an EFT to the IRS with your TIN as a reference this FY? 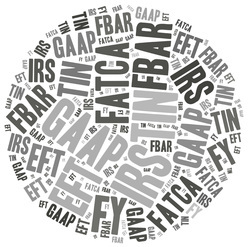 Know your GAAPs from your FATCAs with our handy guide to some of the more commonly spotted IRS acronyms. IRS – Internal Revenue Service. You probably knew that one, but you probably didn’t know that the name was first used in 1918. It was previously known as the Bureau of Internal Revenue, and was established by Lincoln in 1862 to levy an income tax to help pay for the Civil War. This first income tax was 3%, or 5% if you earned over $10,000. Those were the days. Previously, the only federal taxes were on trade and property. TIN – Taxpayer Identification Number. There are various types of these, including SSNs (Social Security Numbers), EINs (Employer Identification Numbers), ITINs (Individual Taxpayer Identification Numbers), and PTINs (Preparer Taxpayer Identification Numbers). Acronyms within an acronym. GAAP – Generally Accepted Accounting Principles. Since 1939, the SEC (Securities and Exchange Commission) has set guidelines for the standards, conventions and rules that accountants use to prepare financial statements. There is currently a movement to change to an international system, but it’s not likely to happen any time soon. EFT – Electronic Funds Transfer. Not too long ago, only banks could transfer money between different accounts, and they charged us for the privilege. Thanks to the internet, we can all make EFTs online now, often at little or no cost. FY – Fiscal Year. This is the year as far as paying taxes is concerned. In many countries it is also the calendar year (January 1st to December 31st), however in the US it runs from October 1st to September 30th. As an expat, it’s worth checking what the FY is in your country of residence, as you may have to file there too. The prize for the strangest FY goes to the UK, whose FY runs from April 6th to April 5th, 11days after new year in an old ecclesiastical calendar that the UK government used before converting to the modern calendar in 1752. They had to skip 11 days that year to catch up with other countries. FBAR – Foreign Bank Account Report. Now on to the fun ones for American expats. FBAR is a report that every American expat (and company) that has one or more bank accounts abroad with a total of more than $10,000 in them has to file annually. In practice this means filing a Form 114 online before June 30th. FATCA – Foreign Account Tax Compliant Act. This law was passed in 2010 to require US expats with foreign bank accounts to declare their offshore earnings and assets. As an American expat, if you have any income or assets abroad, you must fill in and attach form 8938 to your tax return. The US now requires foreign financial institutions (your bank, for example) to register and provide information about US tax payers financial activities too, so your declaration must tally with the info gained from your foreign bank.